The name cycad represents an ancient type of plant once found on every continent but now is restricted to a narrow range of ecosystems in tropical and subtropical areas of the world. 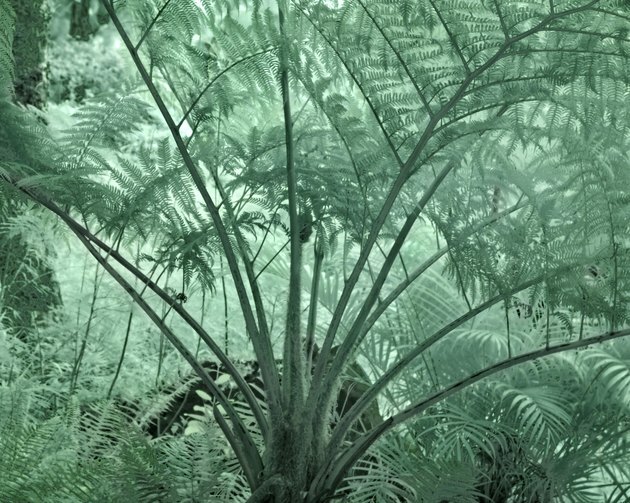 Although the fronds and growth habit of cycads superficially resemble fern trees and palms, they are not related and differ vastly in most respects. Gardeners in warm, frost-free areas sometimes include cycads in their landscaping since the plants possess a dramatic, graceful appearance, and many species transplant easily due to their compact root system and resilient nature. Cycads transplant easily under many circumstances. Water the cycad thoroughly before removing it for transplant. Run a hose at the base for at least 10 minutes to saturate the soil. Cut back the fronds by two-thirds using bypass shears. Discard the pruned fronds or use them to mulch around the base of the plant after transplant. Measure out a 10-inch radius around the base of the cycad. Dig down to a depth of at least 15 inches to excavate as much of the root ball as possible. Use a sharpshooter shovel or narrow, pointed spade for digging around the cycad. Carefully slide the blade of the shovel or spade underneath the cycad root ball. Pry the roots loose by pulling the handle of the shovel backward. Pry the roots from each side to ensure the plant is completely detached from the ground. Lift the cycad from the ground by hand. Ask one or two people to assist if the cycad is very heavy. Move the cycad to the transplant site. Dig a planting hole for the cycad using the same sharpshooter shovel or pointed spade. Dig the hole deep enough so the soil around the base of the cycad remains at its original level. Make the hole twice as wide as the root ball. Settle the cycad into the new planting hole so it stands perfectly upright. Fill in around the roots with the excavated soil until the soil level is flush with the surrounding bed. Water the cycad deeply after transplanting it. Run water around the base of the cycad to settle the soil and remove any air pockets. Spread a 1-to-2-inch-thick layer of mulch around the base of the cycad or spread the fronds removed previously to cool the roots. Leave a 2-inch gap between the edge of the mulch and the trunk of the tree.